If you manage a website whose business model depends on publishing content, you need more than a simple, template-based CMS. Your editing structures may require that multiple eyes look at a piece of content before it gets published, which in turn requires a content management system with automated workflows that allow content to flow from one area to the next. 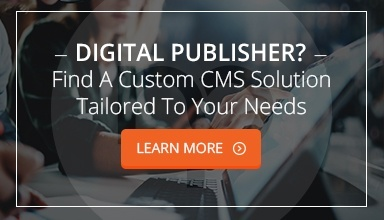 A number of news sites and other types of content publishers have long recognized the value of a custom CMS to meet their editing and publishing workflows. For example, BBC has long used CPS, one of the oldest custom content management systems on the internet. Because the CMS houses 1,200 individual users, a template-based solution like WordPress was simply not an option. Instead, BBC has built a solution with automatic HTML checks and editing workflows that pushes content from the author through the system until publication. The result is a seamless workflow, in which writers write, technical editors check the HTML for validity, and language editors make the final changes needed before the content goes live. Similarly, Buzzfeed (one of the largest content producers on the web today) decided to go with a custom CMS specifically because of the shortcomings of WordPress. The need for company-specific customization, as well as quality control for all of its content, necessitated a solution built specifically for the company. For more publishers that have come to the same conclusion, check out this blog post. The customizability and capability to include a number of differing users on the platform have shifted needs from a template-based CMS to a custom solution. Ultimately, as the examples above show, a custom CMS will better serve the needs of content-reliant websites focusing on news and publication. Your organization likely has a very specific work management flow, in which your content moves from its inception through publication while being touched and improved a number of times along the way. Why find clunky workarounds using template-based systems, when you could go custom instead?